The Flint Northern 1978, 79, 80 & 81 Girls Basketball teams were coached by Dorothy “Dottie” Kukulka. 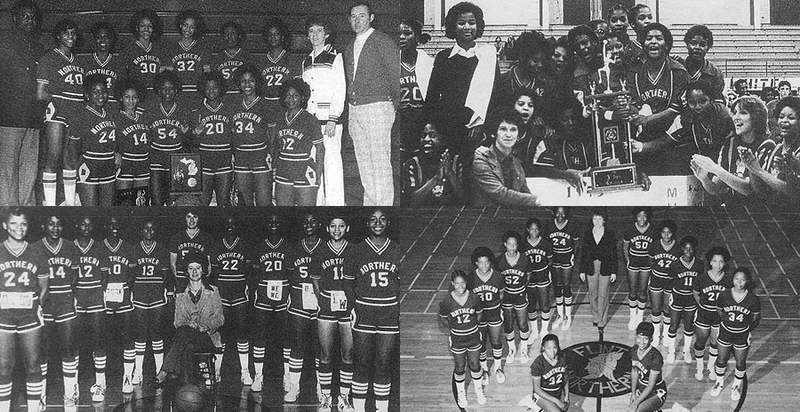 From 1978-1981 the Lady Vikings won four consecutive Class A State Championships. Flint Northern had a record of 23-0 in 1978, 25-0 in 1979, 26-0 in 1980 and 20-6 in 1981. The Lady Vikings won 76 consecutive games during their run. 1978 Roster: Delois Wilson, Pamela Long, Pamela McGee, Paula McGee, Brenda McMillan, Charlotte Baker, Lawanda Hughley, Kim Hughley, Teresa Anthony, Letitia Hughley, Venita Bowie, Kimberly Tartt, Renee Fleming, Pamela Williams. 1979 Roster: Letitia Hughley, Monica Hamlett, Thelisa Anthony, Judy Tucker, Edyth Childress, Lisha Jamison-Williams, Paula McGee, Pamela McGee, Felicia Cooper, Tracy Odum, Pamela Williams, Lawanna Hughley, Velma Anderson, Djuna Smith. 1980 Roster: Thelisa Anthony, Lawanna Hughley, Tracy Odum, Judy Tucker, Terita Baker, Rebecca Bulmash, Charlotte Baker, Letitia Hughley, Djuna Smith, Pamela Williams, Tracy Wells, Velma Johnson, Felicia Cooper, Monica Hamlett, Evette Ott, Tanya Thomas, Sonia D. Breed. 1981 Roster: Tracy Wells, Evette Ott, Yvonne Thompson, Vicki Prince, Sarah Jefferson, Alayna McGee, Felicia Cooper, Sharon Williams-Tyson, Monica Hamlett, Velma Anderson, Monica Hughes, Tanya Thomas, Charlotte Johnson, Sonja Pearson. Flint Northern 1978-1981 Girls Basketball teams you are the true definition of being “Flint Strong”! You have made Flint proud. Welcome to the Greater Flint African American Sports Hall of Fame!